Kale chips are amazing. They boast the same crispy goodness as potato chips only they’re WAY better for you. They’re versatile too, working as a delicious snack on their own, a nice addition to any appetizer spread or as a side with sandwiches. Preheat oven to 350 F. In a small mixing bowl, combine oils, soy sauce, ginger and garlic. Place your kale in a large bowl, drizzle with dressing and toss gently to combine. 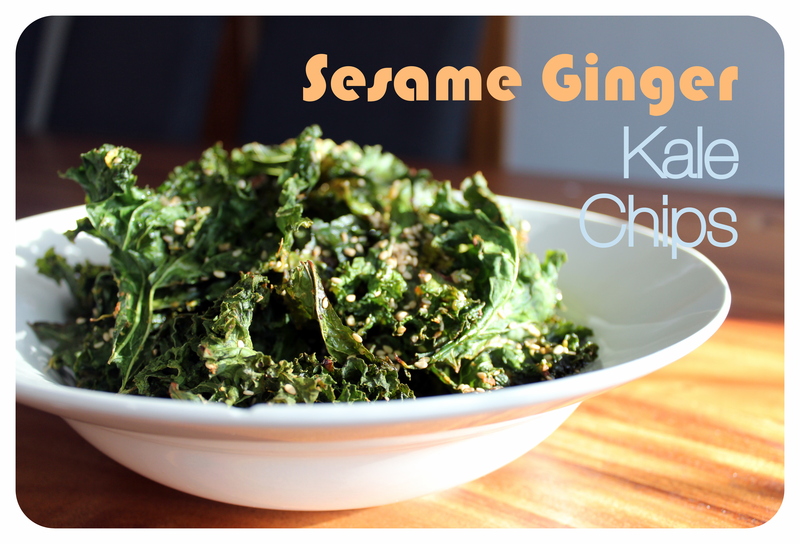 Next, sprinkle nutritional yeast, sesame seeds and fresh cracked pepper over kale. Again, toss gently to combine. Arrange into a single layer on 2 baking sheets. Place in the oven and bake 15 minutes – until leaves are crispy and dark green – not brown. Kale has quite the health food reputation, as it should. This dark leafy green is loaded with vitamins A, C and K. It’s also recognized as a good source of minerals like iron, copper and potassium. Web MD provides more info why it refers to kale as the “queen of greens”. This entry was tagged dinner, lunch, side, Snack, toddler, Vegan, Vegetarian. Bookmark the permalink.